These main pressure compact storage water heaters are ideal for multi-point applications and are perfect for sinks or basins. Available in either 10 or 15 litre capacity, the SHC hot water systems are the perfect solution where hot water is required quickly. 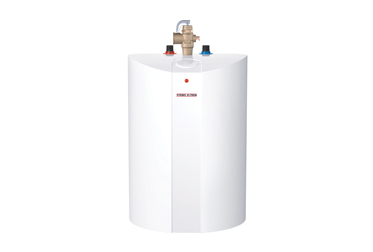 STIEBEL ELTRON SHC mains pressure storage water heaters are designed for point of use installation and can serve multiple outlets at the same time. Compact in size, the system is ideal for where space is limited. These main pressure compact storage water heaters are ideal for multi-point applications and are perfect for sinks or basins. Available in either 10 or 15 litre capacity, the SHC hot water systems are the perfect solution where hot water is required quickly. With their compact design, they can be installed at the point of use to eliminate dead legs. Using the SHC, you can choose any tap you want and match it with your bathroom or kitchen design.